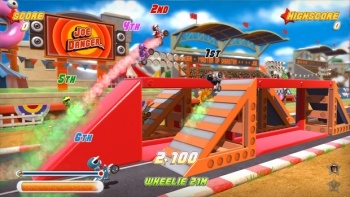 Joe Danger Studio Says Design Documents "Insane"
Design documents are often required in game creation, but the studio that created Joe Danger doesn't believe in them. A videogame's design document is often considered its "bible." Along the development process, designers can look to the document to know where they can and can't go. Though this is somewhat of a standard in game development, Hello Games of Joe Danger fame thinks documentation in game creation is useless. Sean Murray of Hello Games recently said at the Eurogamer Expo: "You can't have design documents." He thinks: "Writing what a game is going to be is just an insane idea." "It's like sitting down to write a recipe and never actually cooking something," Murray added. He justifies his position by referring to classic Japanese games that were designed though experimentation and iteration, rather than typing thousands of words and following along an outline. "I don't think you could design Street Fighter II on paper," he said. "You wouldn't know if it was fun or not. Everything I've read about those developers is that everything was iterative, everything was 'cooked'." Hello Games was able to free itself from the design document by remaining an independent developer and self-publishing though the PlayStation Network. "We had the benefit of not having a publisher, we had time to develop things, we weren't driven by milestones," he reveals. Murray says that because of this, Hello Games can make better products: "We don't have a publisher, we have gamers. And gamers tell us what they want." If the method of creating a videogame is to truly approach that of art, Murray is right that it probably shouldn't be overly documented. Would Picasso have written down exactly where he was going to paint on a canvas? Being locked into a document would seem to eliminate some of the freedom needed to the include cool new features that a studio comes up with on the fly.